They say it’s going to be warm this summer – I say bring it on. It had been grey and windy lately although it’s not cold. But I love to have nice, sunny days. The plants love it though, this warmish and wet condition. New green leaves and flowers are everywhere especially those yellow and white weed flowers on the lawn! A Gold Finch is singing – no, not Gold Finch, sorry it’s a King Fisher. I have read too many fictions lately. 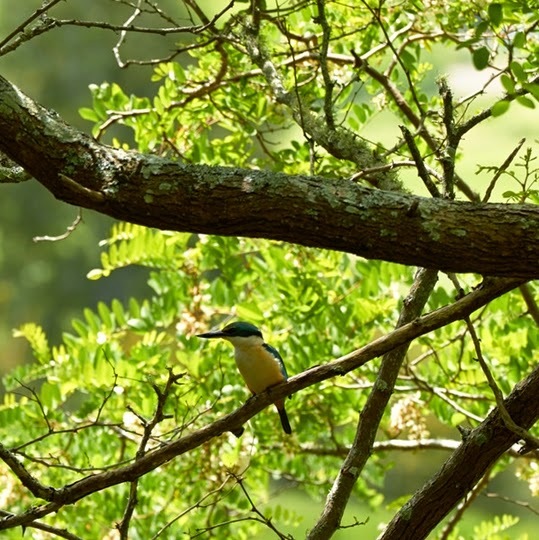 This King Fisher hops from branch to branch and wiggles its little tail – quite lovely indeed! Talking about fictions, I have read The Gold Finch and Gone Girl not long ago. Both are best sellers with the latter made into movie played by Ben Affleck. In my opinion, I have to say that I like The Gold Finch more as a reading material – Gone Girl is rather predictable with its twist – although it’s very entertaining. Having read the novel, I do not plan to see the movie – Ben Affleck is very easy on the eye but I think he could have done better with acting – I’m not saying he’s not a good actor – but he could have put a little bit more effort into it – that’s all.